Alright, it's really short.. but.. not sure what else to have her do..? Amara glanced at her sister, knowing that she could do nothing to stop the Mage. Praying that her sister would remain unscathed she mentally prepared a healing spell as she reached to pull out her crossbow, making sure to keep an eye on her party and orcs, if she needed to heal, she'd be ready but fighting was the main thing she could do to help. Posted on 2013-08-10 at 22:32:00. The stealth was over. Barreel the battle Dwarv had been looking for a fight and now it was presented. Letting out an inarticulate cry he hefted his axe and charged down the hall. Not to be left behind the Paladin Lady Jessica let out a whoop and charged off toward the advancing Orcs. As Barreel charged, the Orcs started to spread out across the hall. Two large Orcs seemed to lead the pack, one down the middle of the hall and one near the wall to its right. Barreel charged the Orc in the middle (#1) and Lady Jessica veered to her left to intercept the other (#2). The magic in the wall had robbed the mage of his favorite tactic, to vanish, sneak up on his target and then attack. So now relying on his weapon proficiency Ulthok pulled his (+2) bow of speed as his companions charged. As the two lead Orcs charged a third appeared between them and slightly behind. 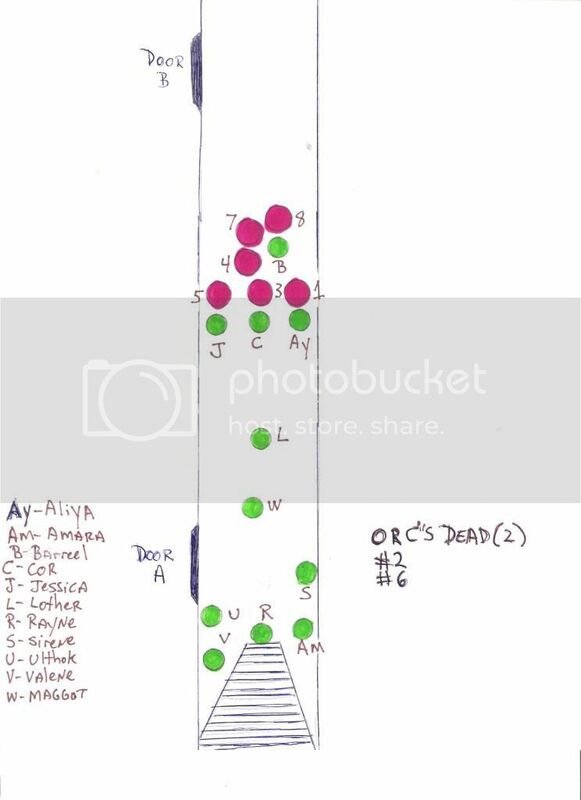 As Lady Jessica moved left and Barreel moved right it opened a clear path so Ulthok loosed four (+3) arrows in rapid succession into the third Orc (#4). Posted on 2013-08-11 at 01:33:26. It was hard not to move to help the paladin in the grip of a huge orc. but long years of discipline keep her in place. Quiet quick words overheard let Rayne know that it was not so for all of their small party. However, cool heads prevailed against normal instincts, especially for thier new Paladin Lady Jessica, tayen knew their code well. Aeryon had chosen that path in life. Rayen knew what that choice had cost their relationship. They had been the best of friends and more but know they were ony best friends. When Ulthok stopped at a door and whispered of strong detection magics, Rayne prepared for battle. Of course they would have such precautions against hostile , well hostile to them, incursions. Posted on 2013-08-11 at 07:09:17. The tell tale tingle of magic crawled up Sir�ne's skin as each of her companions passed through the doorway into the corridor beyond. She watched as her well crafted illusions each faded away beyond the threshold. A hissing exhale left her lips as the copper skinned elf moved into the hallway. Whatever magics flowed through this fortress rendered illusions useless, she would not be able to call forth the dream world here. Still, the enchantress held onto the spell, rather than letting it dissipate into ether. They were not the only ones who came to this castle to destroy it. If the lot of them became orcs again, she would know someone had succeeded and it was time to retreat. Appearing as herself once again, Sir�ne followed the others down the hallway, gliding with every measure of elven grace she possessed. The loss of the illusion was frustrating, but she could not deny shedding the orcish form gave her a queer sense of pleasure. Useful as it may have been, it was a distasteful illusion at the very least, orcs were vile creatures. In a seemingly fitting turn of events, the empty hallway filled with guttural chortling followed by eight fully armed, and battle ready hulking beasts. The orcish behemoths roared as they charged forward and the party spun into action. As the air filled with battle cries and the warriors charged forward, Sir�ne scanned the orcs. At middle of their ranks she found the ugliest orc she had ever seen. A cruel smile formed on her lips and the priestess locked eyes with the beast. Deft fingers flashed and a word of power cracked through the air as Sir�ne cast her spell. Five motes of blue light spun out from her fingertips at a terrible speed, leaving trails of fading blue light as the flew towards the beast. She dearly hoped they would rid the creature of its hideous head. Posted on 2013-08-12 at 00:17:11. With their disguises gone and the appearance of the eight charging giant Orcs. All hope of staying unseen was lost and all that was left was to fight. A fight for some long over do as first Barreel then the Lady Jessica charged forward to meet the Orc�s. With Maggot, singing in the background the Lady Jessica found herself facing Orc(#2) and as they came within melee range both began to swing. The Orc�s double attack gained him nothing as Jessica�s sword ripped through his midsection ripping out his guts. However as he started to fall his mouth opened and he spit into her face barely missing her eyes. His saliva almost as if pepper spray she could feel it burning her cheek and the smell almost making her choke. As she moved to meet the next Orc(#5) it was already upon her and of its two attacks it scored a blow with its large axe. Though not a full blow thanks to her armor it still caused impact damage causing the breath in her chest to be expelled violently. A snarl on her face she readied herself for her next attack. Sirene having quickly made it up the stairs had moved to its right side to allow for the rest of the party unblocked access. Seeing that Barreel was about to engage Orcs(#1, #3) saw Orc(#6) all by himself and ugly. Hand raised a quick word of casting and five missiles of magic flew straight and true hitting the huge Orc in full stride and except for a small break in his step not stopping him at all. A grimace of pain clear on his face he just kept coming, only to find himself facing a Dwarven Berserker. For the Fighter/Mage Aliya Moonshadow this was her first fight with this new party and she was not about to let them down. A fast cast of Flame Arrow, the arrow hitting Orc(#4) she drew sword and dagger and gained a free attack on Orc(#1) as he was still tangled with Orc(#3). Though her sword was out of position her dagger was not as it sank deep into the Orc�s side. Finally free and standing this Orc would be her opponent for round two. For Ulthok in front of the rest of the party, but now behind Barreel, the Lady Jessica and Aliya and without his ability to go invisible turned to plan B. Grabbing his short bow of Speed he loaded and fired four arrows in the time needed for two. 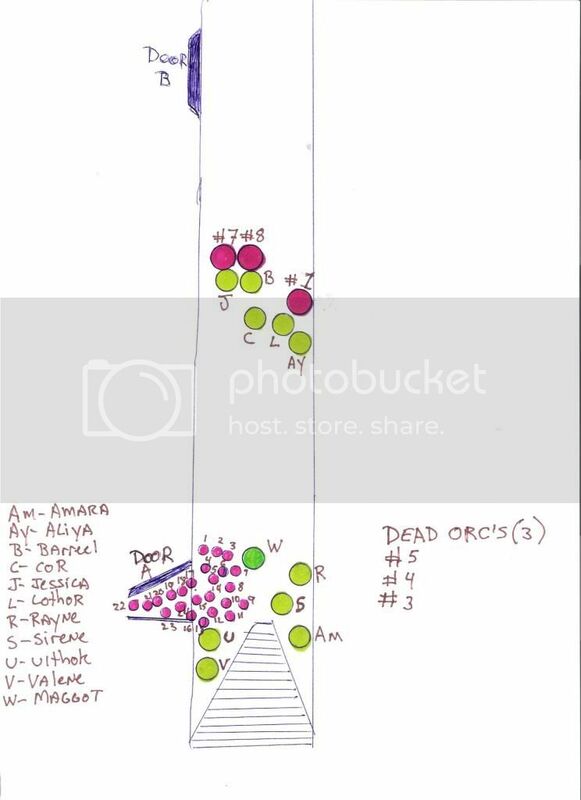 By chance, his target Orc(#4) had already taken damage from Aliya�s Flame Arrow and the combined impact of the four arrows and the spell threw the Orc off his feet to slam to the hallway floor. Clearly massively hurt and bleeding it was yet still alive for the moment. For Ulthok his next target yet to be chosen. As Cor moved forward he watched the charge of the three party members and as Barreel pushed past Orc�s (#1 & #3) Lady Jessica engaged Orc(#2) and Aliya faced Orc(#1) he saw Orc(#3) return to it�s feet and start moving in on Aliya. Moving quickly Cor met the Orc head on and the two were quickly engaged. As both were slightly off balance in their attacks, they went one for one in hits as Cor struck hard with his axe yet was rocked back by a powerful strike from the Orc�s large sword. Though both strikes caused minimum damage due to armor, the Orc�s attack on Aliya was stopped. Both strong hands on his axe Cor readied himself for next round. Amara having found herself on the stairs as the battle begin quickly drew her sling and moved to the far wall to cover the first door as she readied a spell of healing if needed. Though not a pacifist, she still was not the fighter type like her sister so for her it was better to keep watch then charge in. For the rest of the party, Lother, Rayne and Valene as they made the top of the stairs the battle to their front was already in full swing and targets were hard to find. As Lother made his way forward, Valene peeled off to the side behind Ulthok and Rayne stood center of the stairs Anduril�s Blood once more in hand, the stage was set for round two. Posted on 2013-08-12 at 05:19:43. Bareel's song continued as his rage continued to grow (Rd 2); as he cut through the Giant Orcs, bowling over some and cutting down others. The dwarf grinned as he faced his latest opponent (#8 ); blood from one of this orcs companions dripping off the spikes of his armor. His axe dripping in Orc blood, Bareel swung viciously at his adversary as if he were trying to split it in half. If that one still stood he would continue his attack on it, if it fell he would turn to it's neighbor who would feel the sting of his razor-sharp blade. Posted on 2013-08-12 at 22:46:14. Lady Jessica felt her sword rip through her opponent and grinned slightly; it felt good to be in battle once again. But as the ugly beast fell it spit at her; she managed to close her eyes and duck away but her cheek felt the moisture through the open face of her helm and then began to burn slightly. It wasn't a terrible burn like fire, more like a irritant but it might blind her if it had hit her eyes. She wiped it away and coughed a couple times at the putrid odor as another of the beasts moved up to take the place of the fallen. "Watch out!" she yelled a warning to the others, "they spit and it burns the skin and might blind you." Holding her shield tightly she dodged and weaved as the next Orc swung and missed her; with a battle cry to Athena, she struck back at the creature letting her sword sing through the air. Posted on 2013-08-13 at 23:13:41. Weaver Continued his song of old hoping the others would soon find something deep inside them to bring to this dance of death. Posted on 2013-08-15 at 00:19:33. Cor noticed one of the orcs stand up to attack Aliya. Charging forward, Cor went to the defense of his comrade. The orc and Cor quickly became engaged in combat, trading blows. Even though Cor hit the orc solidly, the orc returned with it's own blow. Cor grunted as he was hit. Neither of the two of them significantly hurt the other one, but both had proved their point. "Watch out!" she[Lady Jessica] yelled a warning to the others, "they spit and it burns the skin and might blind you." Unable to draw his attention away from the orc, Cor replied, "Thanks for the warning." Cor worried for a moment that he may have sounded too gruff, as he intended it as actual thanks, but he quickly felt his attention drawn back to the orc. Cor snarled at the orc, " Now let's see what you can do!" Cor, gripping his axe and readying a overhand strike, prepared for another round of attack and defense. Posted on 2013-08-16 at 03:27:52. Andurile's Blood in hand, Rayne's soft lavender eyes scan the bloody scene before her. The Cleric noticed two orcs were down, but that one of her comrades were surrounded by the giant beasts. She quickly realized that there was no way to get a clear shot with her friends standing between her and the giant orcs. The cleric decided she would cast a spell instead of using her bow during this round. Rayne put her bow away and cast BLESS on her allies. Posted on 2013-08-18 at 02:58:07. Peri hovered above Ulthok near the ceiling, she could see the battle clearly. "Three of these on the floor are not dead yet. ", sending the thought to Ulthok.
" I can't get a clear shot on them." he sent back. "Well shot the one standing then!" Well gosh, I'd hadn't thought of that. ", he sent back sarcasticly. Posted on 2013-08-18 at 03:14:47. With narrowed eyes, the enchantress moved into another spell. Gestures and esoteric chanting drew forth power from the earth and sun. Graceful fingers deftly spun threads of power from the solar and ferrous energy flowing through her. The earthen power, mixed with heat from the sun, flew outward to seek their like kind in the metal armor and weapons of the orcs. Soon the beasts' weapons would turn against them and glow with a molten heat. Posted on 2013-08-18 at 04:03:10.
something about fighting makes me think of bears idk why? Alyia quickly glanced over her shoulder at the other party members joining the fray. As she slipped her dagger from the orc's side, parrying a glancing blow with her sword blade. she danced about the orc slipping her dagger again and again in between the chinks in his amour. Alyia evaded most of the blows and parried the ones she couldn't, the seams wept and darkened the leather hem. sensing cor charge beside her she renewed her attack dodging blows harrying the orc every keeping his attention on her. Alyia slowed as the orc began to falter, like a wounded bear the orc groaned and bellowed in frustration. lady Jessica's warring was heard just above the din echoing in the hall. Alyia burying the dagger deep between the orcs shoulder blades Alyia stepped back and with two hands on her sword she swung hard at the orc's head and shoulders meaning to cleave his head clean off. as the orc fell at her feet she glanced up at the rest of the party still fighting, what had felt like long hours had taken all but minutes. Aliya looked over the members of the party still fighting and was impressed with this new group, finally after leading ranks of men to battle she had found those among those numbers who truly equaled and surpassed her. she gasped taking in the solid thud of a blunt direct hit metal plating. Alyia grinned and for a swift moment watched cor and the orc pace one another and reading the movements of each. they were equally matched but she could see weaknesses with in the orc's stance which would allow cor the upper hand. Alyia turned and flowed Bareel deeper into the fray, the dwarf looked like a little blood soaked bear. Posted on 2013-08-18 at 05:11:10. As the second round of combat began the party members in the fight had clearly won the first round. With two Orcs dead and a third seriously hurt compared to very light damage to the party it would not take long to finish this fight. The first of the party to act this turn was the Enchantress Sirene, her spell of Heat Metal quickly cast upon the metal armor clad Orc�s. As the armor slowly began to get hot Sirene knew that though the spell would not start to do damage till rounds 2-6, once it started the Orc�s would be in for a lot of pain. The only question now was would they last that long. As Rayne having finally reached the top of the stairs saw no way to use her favorite weapon, her bow �Anduril�s Blood�, instead she turned to the next best thing for the party, the spell of Bless. Easily casting the spell she had cast so many times before she was happy to see it take effect at once. The fighters seeming to increase in size in her eyes. Hopefully the upcoming next round her line of sight would be clear and her bow to action once more. For the four party members engaged in hand to hand melee or in the case of Barreel body to hand it was all about hack & slash, the first of which to act was the Lady Jessica. Her shield high her sword again straight and targeting true she slammed both into the Orc before her (#5) blocking his attack and forcing him to fall back bleeding. As he moved forward once more the Paladin�s second attack like the first was dead on and cleaved the Orc�s ugly head from it�s shoulders. As the Orc fell to the floor dead she moved to attack the next available target. For Aliya as with the others on this front line it was hack, slash, and hope for a quick kill. Disregarding both magic spell and familiar, she attacked the nearest Orc to her. (#1) However as she moved into the attack her grip on the Vorpal sword in her hand faltered and instead of striking hard the sword flew from her hand to land behind the Orc and out of her reach. Thanks to her quick dexterity as the Orc�s axe started to find flesh she was just able to parry the large axe from doing massive damage with her dagger. Though she found herself bleeding and in a very bad position facing an unhurt battle-axe wielding Orc. If not for that +2 dagger things could have been much, much worse. For Barreel he finally had the fight he had been wanting for quite some time now. Having quickly shown his worth to the party with his charge and quick killing of an giant eight foot tall Orc. Grinning madly he turned to face his next target Orc #8 without caring that he left himself open to the Orc�s on his flank (#7, #4). After all battle was a place to kill your enemies, what was a little pain if you could watch as your enemies died. The rage within him growing he lashed out at the Orc and felt the pleasure of his axe breaking through armor and into the Orc�s flesh. Drawing it back he never got his second attack as the Orc next to him (#7) slammed into his side. Though he was pushed into the wall and took damage from its axe. Barreel still had the last laugh as the Orc moved backwards finding itself bleeding from numerous little wounds upon its body from the Dwarf�s armor. Though minor wounds all, still they were wounds and as the Dwarf Berserker came off the wall and charged forward he could smell it�s blood in the air. Next in the line of attack was Ulthok. In a better position then Rayne for missile fire he again sent four arrows flying down the hall this time aimed at Orc #7. However as the arrows flew Orc #4 seeking to attack Barreel from behind stepped in front of Orc #7 and took all four arrows instead. Once again the pin cushion for another four arrows the Orc steps faltered then stopped as he fell to the ground dead. His possibly deadly unprotected attack against Barreel never delivered. For Cor his choice of target was quite easy as Orc #3 stood in front of him once more ready to exchange blows. With Aliya now in a very bad position having just lost her sword the Dwarf Knight Cleric had no time to dilly dally. As the Orc tried to dodge and swing Cor simply stood his ground, raised his axe over his head and as the Orc axe slammed into him and rebounded, slashed the twin bladed axe down on Orc�s head and spilt it�s skull in two and continuing to cut down into it�s chest. Removing his axe easily, helped with the now dead Orc�s falling weight, he moved forward to help the Half-Elf Fighter/Mage Aliya. For Amara and Valene the last of the party to act whatever actions they had in mind were forgotten as the first door of the hallway opened and a pair of flat faced, broad nosed creatures with pointed ears, wide mouths and small sharp looking fangs peered out. Their foreheads sloped back, and their eyes holding a dull and glazed look the two female party members knew at once what these creatures were. �GOBLINS!� Both yelled at almost the same time as the door was flung wide and a host of the little grubby evil creatures burst into the hallway to join the fight. And in the middle of the hallway between the party members to his front, the party members to his rear, and at least 200 Goblins to his left Weaver continued to sing. (DM OOC: Ok there you have this weeks post and map. As always check the first post in the Character thread for any damage. Next post next Sunday hopefully as normal. Posted on 2013-08-19 at 03:29:15. As the Goblins burst through the door Valene brought her sword up, ready to attack anything that came close. She wasn't a huge fan of close quarters combat, but it looked as though she wasn't getting much of a choice. She certainly wasn't going to try to escape by herself. She lunged with the blade, trying to drive it into the throat of the nearest goblin. She wanted to get back closer to Ulthok. Maybe the two of them could figure out a way to handle that many goblins all at once. Goblins had a nasty way of overwhelming groups with their numbers and she certainly didn't want them losing any of their tall ones already. Posted on 2013-08-19 at 04:54:21.